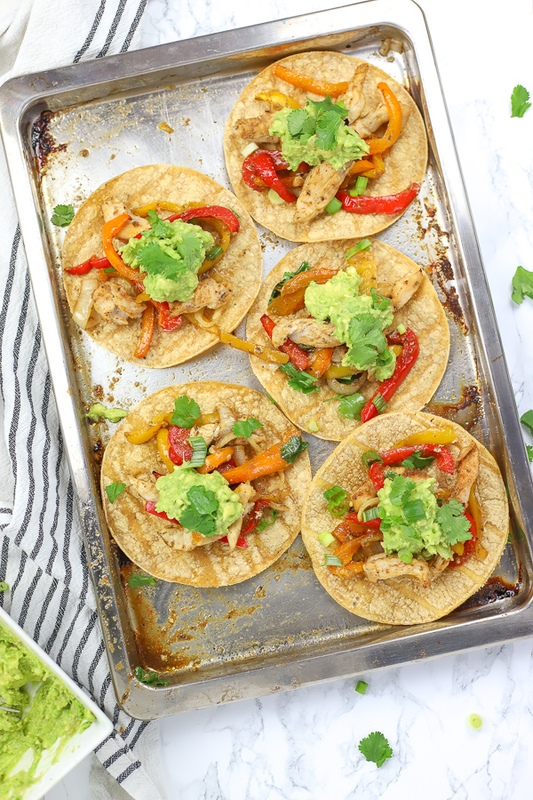 Sheet pan Chicken Fajitas are a flavorful and easy meal that can be thrown together. 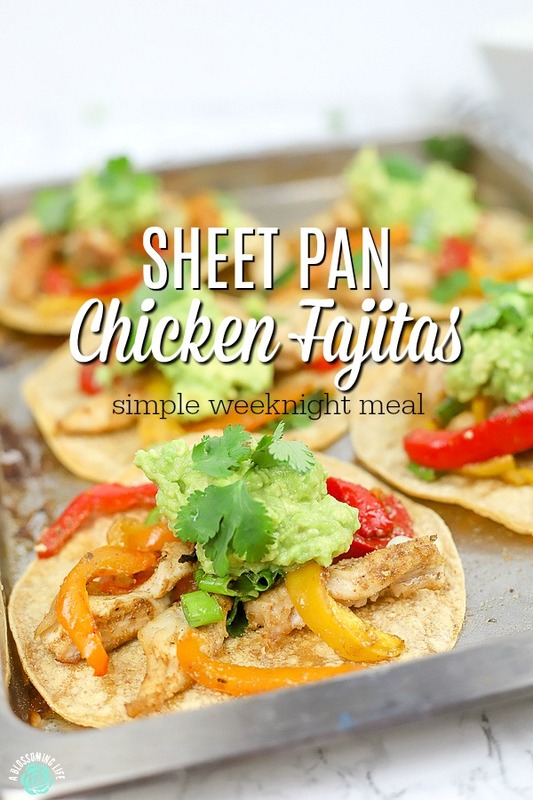 This one pan meal will easily become a family favorite for an easy weeknight dinner. 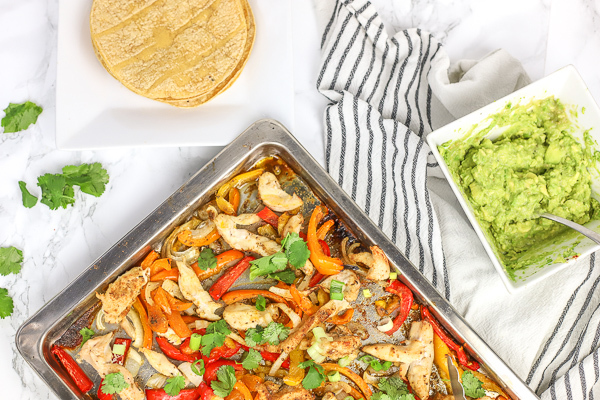 Follow my tips below for the best sheet pan chicken fajitas. Ingredients you will need: peppers, onions, raw chicken, fajita seasoning, oil, tortillas, and other fajita toppings if you so desire (guacamole, sour cream, cheese, etc). One of my favorite things about sheet pan dinners is the ability to prep everything, throw it all on a pan, stick it in the oven, and then clean up the kitchen while it is baking. After dinner, clean up is so simple and just takes a few minutes to throw the dishes in the dishwasher. Having dinner made, eaten, and cleaned up in just a short time is a serious win, and I love that the kitchen is basically clean as soon as our bellies are full. 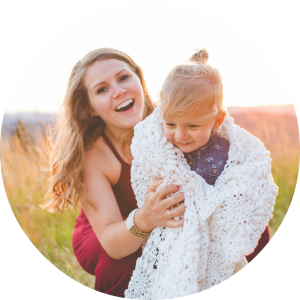 Basically, healthy and easy meals (that are also easy to clean up) are a staple in our house. My family loved this recipe. But they will eat just about anything that is Mexican-inspired. That is, unless it is covered in avocado, then one of my kids won’t even think of eating it. She’ll eat guacamole, but avocado? Forget about it. 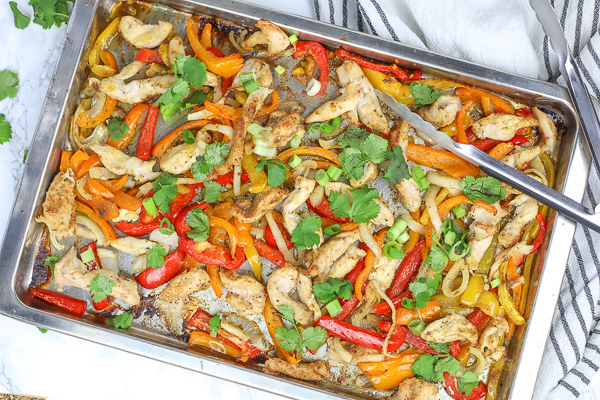 Anyway, my family loved these sheet pan fajitas. Be aware, though: I used some cayenne pepper in the fajita seasoning, and it had a slight kick. Didn’t stop my 1-year-old and 3-year-old though. My 1-year-old will basically eat anything, including raw onions he snatches from the floor (true story). My 3-year-old is a little more aware of what she is eating. She loved these sheet pan chicken fajitas, but kept a glass of milk close by and took sips every so often. These have only a slight kick to them, but kids’ taste buds are more sensitive that adults. If you don’t like any spice, no worries; just leave out the cayenne pepper. Make your own fajita seasoning (shared below) or purchase your favorite seasoning. Serve with tortillas; we use corn since we are gluten free, but use whatever you like. Make them into nachos by spreading the chicken fajita mixture over tortilla chips and topping them with cheese. If you don’t like it spicy, leave out the cayenne pepper. Slice all the ingredients about the same size and thickness for even cooking times. Small bowl for mixing fajita seasoning. Preheat oven to 400 degrees. Slice onions, peppers, and chicken to roughly the same size and thickness. Spread ingredients out evenly on a baking sheet. Drizzle with olive oil and fajita seasoning and toss. Place in the oven for 25-35 minutes until chicken and peppers start to brown a little and the chicken reaches an internal temperature of 165. When there is about 5 minutes left, place tortillas directly onto the oven rack and allow to heat up for 3-5 minutes. Not much longer, though, or they will get hard. Serve with your favorite fajita toppings: guacamole, cilantro, green onions, cheese, hot sauce, whatever your heart desires. Need more easy dinner ideas? Check these out! Chicken Lentil Soup is much faster than traditional lentil soup. This is one of our family’s favorite meals. We top it with some cilantro and the easiest guacamole ever. 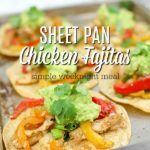 Simple and easy weeknight meal, sheet pan chicken fajitas will easily become a family favorite. 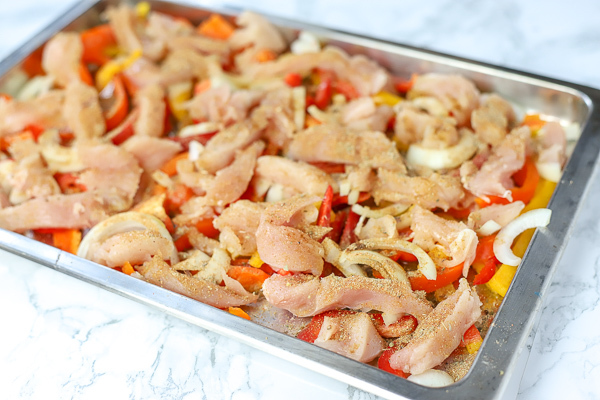 Place in the oven for 25-35 minutes until chicken and peppers start to brown a little and reaches an internal temperature of 165. Serve with your favorite fajita toppings: guacamole, cilantro, green onions, cheese, hot sauce, whatever your heard desires. What are your favorite one pan meals? Sheetpan meals are the best. Saved for later! And so convenient! Love them.